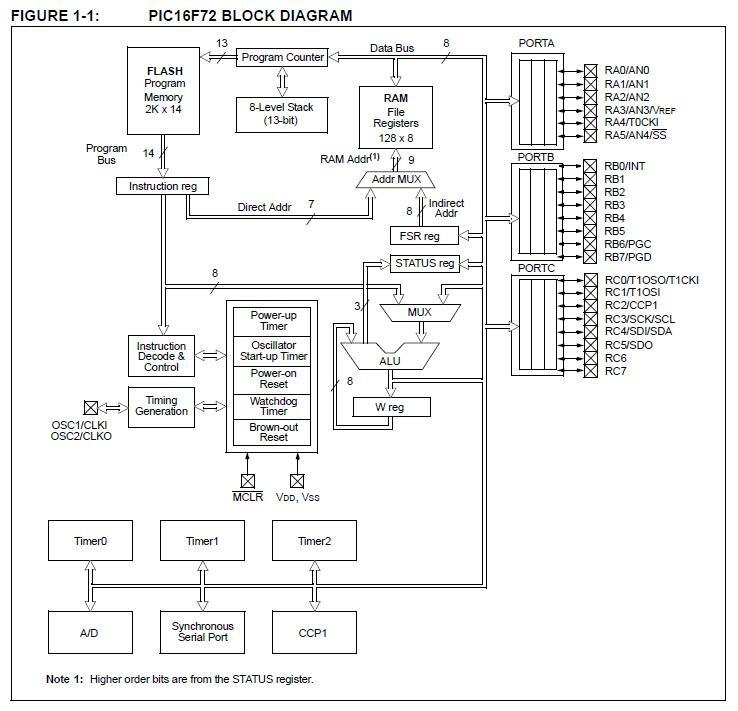 The PIC16F72-I/SP is a 28-Pin, 8-Bit CMOS FLASH Microcontroller with A/D Converter. PIC16F72-I/SP outright most extreme appraisals: (1)Ambient temperature under predisposition: - 55 to +125℃; (2)Storage temperature: - 65℃ to +150℃; (3)Voltage on any stick concerning VSS (with the exception of VDD, MCLR. also, RA4): - 0.3V to (VDD + 0.3V); (4)Voltage on VDD regarding VSS: - 0.3 to +6.5V; (5)Voltage on MCLR as for VSS: 0 to +13.5V; (6)Voltage on RA4 as for Vss: 0 to +12V; (7)Total power dispersal: 1.0W; (8)Maximum current out of VSS stick: 300 mA; (9)Maximum current into VDD stick: 250 mA; (10)Input brace current, IIK (VI < 0 or VI > VDD): ± 20 mA; (11)Output clasp current, IOK (VO < 0 or VO > VDD): ± 20 mA; (12)Maximum yield current sunk by any I/O stick: 25 mA; (13)Maximum yield current sourced by any I/O stick: 25 mA; (14)Maximum current sunk by PORTA, PORTB: 200 mA; (15)Maximum current sourced by PORTA, PORTB: 200 mA; (16)Maximum current sunk by PORTC: 200 mA; (17)Maximum current sourced by PORTC: 200 mA. PIC16F72-I/SP highlights: (1)High Sink/Source Current: 25 mA; (2)Timer0: 8-bit clock/counter with 8-bit prescaler; (3)Timer1: 16-bit clock/counter with prescaler, can be increased amid SLEEP by means of outside gem/clock; (4)Timer2: 8-bit clock/counter with 8-bit period enlist, prescaler and postscaler; (5)Capture, Compare, PWM (CCP) module: Capture is 16-bit, worst case scenario. goals is 12.5 ns, Compare is 16-bit, at the most. goals is 200 ns, PWM max. goals is 10-bit; (6)8-piece, 5-channel simple to-advanced converter; (7)Synchronous Serial Port (SSP) with SPI (Master/Slave) and I2C (Slave); (8)Brown-out recognition hardware for Brown-out Reset (BOR).